Rava said about a fever: "Were it not for the fact that it is an agent of the Angel of Death, it would be beneficial for a person as a prickly foliage is for palm trees, if it is experienced once every thirty days...(Nedarim 41a-b). As an emergency physician I've treated hundreds and hundreds of patients who came to the ER with a fever. In fact fever is the third most common reason in the US for which people visit the ER - accounting for over 5 million visits each year. At virtually every visit they'd be given a medicine to reduce their fever, as if by doing so we were achieving something medically important. But in this page of Talmud, we read that according to Rava, fever is actually beneficial to a person (at least when it does not kill...). How does this claim made by Rava, a Babylonian sage who died around the year 352 CE, stand up to today's medical science? Remarkably well, it turns out. Here's why. Here are some basic things to know about fever. First, it is usually defined as a core temperature in humans above 38.3 C, or 101 F. Second, there are lots of reasons why people get a fever, of which bacterial and viral infections are the most common, but not the only causes. Third, and this is really important, not all fevers mean the same thing in terms of their seriousness. Fever in a baby less than a month old requires an urgent and extensive evaluation. The same fever in a healthy toddler does not. Fever in a healthy teenager is not the same as fever in an elderly patient on chemotherapy. Finally, fever is not caused by the infection, at least not in the way you might think. It is the body's response to that infection that produces a fever. Here's how. When bacteria infect the body, their foreign structure is recognized by white cells in the blood called macrophages. These macrophages then release a prostaglandin E2, interleukin-1, interleukin-6, and tumor necrosis factor. These act on a region deep in the brain called the hypothalamus, which acts as a thermostat for the body. 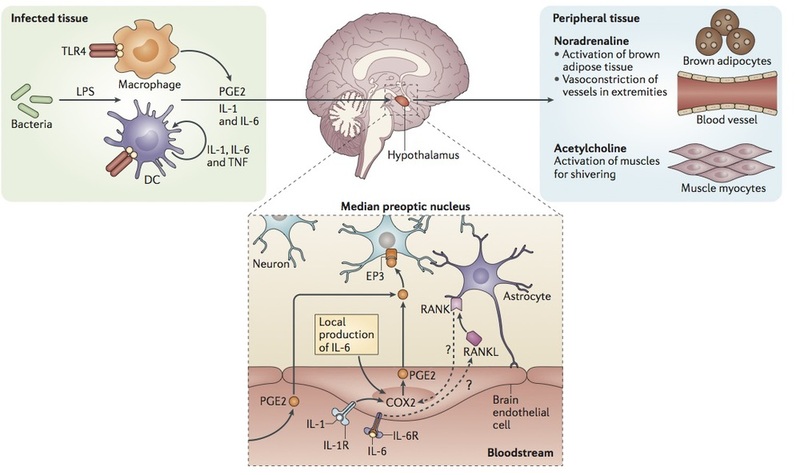 Under the influence of interleukin-1 the hypothalamus releases a hormone called cyclooxygenase 2 (COX-2) which resets the body's thermostat, causing the temperature of the body to rise by a few degrees. How a fever is caused by a bacterial infection. From Evans, Repasky and Fisher. Fever and the thermal regulation of immunity: the immune system feels the heat. Nature Reviews Immunology June 2015: 15: 337. It's not just people who get fevers. Dogs and cats do too, as do mice (and all mammals), reptiles, and even goldfish. Why would so many animals respond to an infection by developing a fever? The reason is simple. The immune system fights infections better when the body is hotter. The way it does this is now well-understood but very complicated; here are just the highlights. Under what immunologists call "thermal stress" (and the rest of us call "a fever",) neutrophils, the white cells that are needed to fight infection, are released in greater numbers from the bone marrow. These neutrophils also do a better job of fighting bacteria at the site of the infection when the body is warmer. Fever also improves the killing ability of another group of blood cells called natural killer cells, and it increases the ability of the macrophages to ingest and destroy the invading bacteria. As last month's excellent review of fever and the thermal regulation of immunity in Nature Reviews concluded, "[t]he picture that emerges is one in which febrile temperatures serve as a systemic alert system that broadly promotes immune surveillance during challenge by invading pathogens." So your body does a better job of fighting bacteria when it is hotter. Why then, do doctors give medicines that reduce a fever? Good question. The truth is, they really shouldn't. If you are the parent of a child with a fever, you are likely to give your sick offspring a medicine that interferes with the immune system, like Tylenol if you are in the US, Paracetamol if you are in the UK or South Africa, or Acamol in Israel (though they are different words for the same medicine.) But if, as we have seen, the body does a better job of fighting infection when it is a few degrees hotter, might reducing the fever lead to a worse outcome for the child? — Ryan and Levy. Clinical Review: Fever in intensive care patients. Critical Care 2003, 7:224. The Canadian investigators concluded that "...the use of antipyretics can have subtle and potentially important negative effects at the population level. Any medical intervention that aims to relieve the symptoms of an infectious disease in an individual should also be evaluated in light of potentially harmful effects at the population level..." And it's not just populations that can suffer; individual patients are at risk too. In a 2011 paper looking at the treatment of fever in very ill patients with sepsis in the ICU, a French team looked at the beneficial and detrimental effects of fever, and concluded that "...the widespread use of antipyretic methods in ICU patients is not supported by clinical data and fever control may be harmful, particularly when an infectious disease is progressing..."
So Rava's teaching in tomorrow's daf, Nedarim 41b appears to be spot on. Fever is indeed beneficial for the body, though it is a sign that something bad is going on. Elsewhere in the Talmud (Niddah 36b, which we will learn on November 28, 2019, הבא עלינו לטובה) we read that another Babylonian Amora, Rav Assi, died from a fever accompanied with chills - the classic description of sepsis (and a lot else besides, too). It is interesting to note that Rav Assi's attendants tried to reduce his fever. Perhaps they not aware of the tradition that Rava - who was born two generations later - would later teach. Fever may be beneficial, but the underlying infection of which it is a sign never is. Which is why,in the next daf (Nedaraim 42,) Rava's teaching was not accepted by by Rav Nachman bar Yitzchak who retorted: לא היא ולא תירייקה: "Give me neither fever, nor its antidote!"